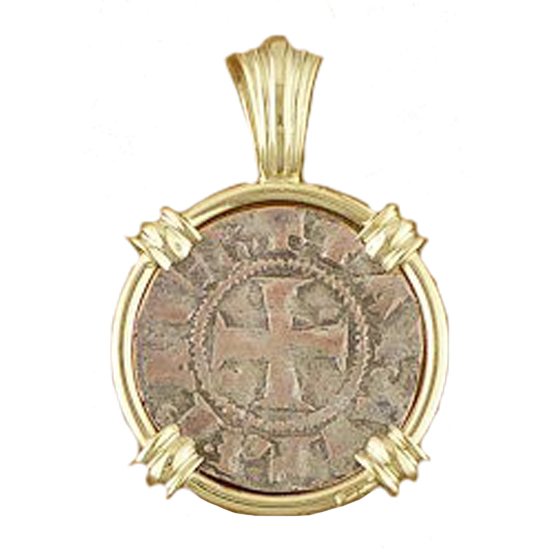 Silver Crusader Denier-Tournois coin, circa 1316-1318 framed in 14Kt yellow gold pendant.Obverse: Crusader cross patee, Coat of Arms of the Principality of Achaea, within dotted circle, surrounded by legend. Reverse: Castle or chateau tournois with DE CLARENCIA (the mint and main port of the Principality of Achaea) lettering around. Initially the denier (penny) of base silver was struck by the abbots of St. Martin of Tours, France. Subsequently a coin of the same type was struck by the kings of France and in several Frankish states in Greece after the Fourth Crusade. Certificate of Authenticity. Dimensions; 7/8" wide, 1-1/4" drop including bail.